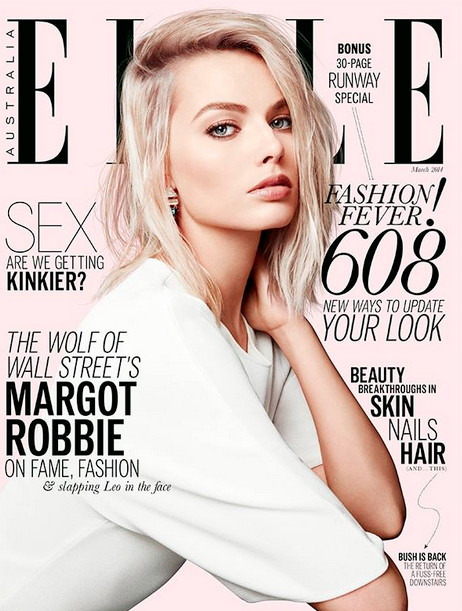 The Wolf of Wall Street star strikes a sultry pose for Elle Australia. Australian actress Margot Robbie currently has heads turning across the globe after her role opposite Leonardo DiCaprio in The Wolf of Wall Street. The home grown hottie poses in the latest issue of Elle Australia, keeping it classy in white on the cover of the fashion glossy. This is the 23 year old’s first feature magazine cover in Australia. She has definitely come a long way since her days of playing girl next door Donna Freedman on Aussie soap Neighbours. Her risque role in The Wolf of Wall Street is not the only thing that has Hollywood talking. Some saucy photos of Robbie and Will Smith have emerged, raising eyebrows across tinsel town. Both stars are working together in new romantic comedy Focus, and Robbie confirms to Elle magazine that the relationship is strictly professional. If you weren’t jealous of the Aussie glamazon’s co-star list up until now (come on Leo Dicaprio, how can you beat that) then get braced for her next project. ← Lara Bingle and Sam Worthington married?